In 2011 we decided to work on one of our founders long-time dream: to visualize where people use their bicycles in our home city, Budapest. We wanted to see which roads and paths are frequented by fellow bikers. So we quickly put together two mobile apps which make it easy to upload bicycle routes to our server. The apps quickly found their way to important bicycle forums and the red lines on the map slowly got thicker and thicker. 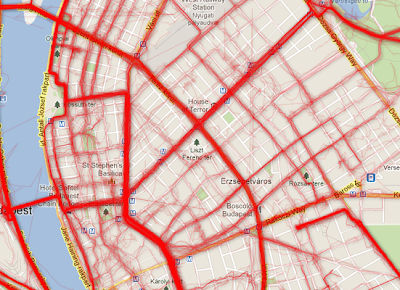 In 3 months we had all Budapest covered with bicycle paths. We were amazed by the usefulness of this simple visualization. It helped us to find shortcuts for our own journeys, analyze habits of fellow cyclers, and to get a general idea about bicycle usage in our city. It was a great success. This year, we are opening up UrbanCyclr to all cities in the world. We are inviting everybody to participate in this world-wide experiment to create such visualizations for all cities. All you need to do is to download our mobile apps and participate in drawing bicycle maps for your cities. It's really just 2 taps per ride.